Congratulations to Men "The Master" Nguyen who has claimed his seventh WSOP bracelet in a dramatic final day of Event #10: $10,000 Seven Card Stud Championship. Both Nguyen and runner-up Brandon Adams had some challenging moments throughout the day, with both being short and all in on different occasions. However they showed great fighting qualities and with chips at their disposal they both were dangerous in contrasting ways. Adams was all class and composure as his tight, solid image was utilized perfectly, while Nguyen's in-your-face aggression was relentless on the final table. 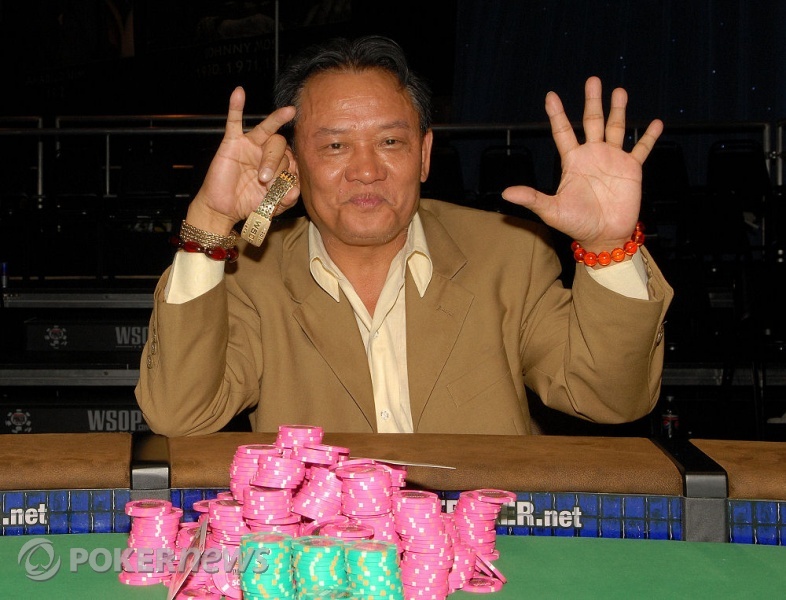 There were times where Nguyen looked like he was equally as likely to tilt off all of his chips or pass out on the floor, but in the end he did what he does best, and ran away with the title as he collected his seventh WSOP bracelet and $394,800 in prize money. He proved once again why he is known simply as "The Master"! Congratulations Men! Men Nguyen was in a great mood as he slowly but surely widened his chip lead on Brandon Adams. On their penultimate hand, Nguyen asked, "What have you got there Brian?" "350," replied Adams, without correcting Men as to Adams' proper first name. "I might bust you on this hand." But Nguyen didn't. He folded fourth street. As the dealer was dealing the next and final hand, Nguyen leaned across the table to the short-stacked Adams. "Play all in now Brian?" Adams looked up at Nguyen. "You commit to go all in blind in front of all of these people?" Adams asked, pointing at the gallery. "Yeah, yeah," said Nguyen. "All in blind. I haven't looked. You looked? All in blind." "Ok, all in blind," replied Adams. They raised back and forth until Adams was all in for his last 360,000. He opened / . Nguyen rubbed his hands together and then slammed over / . The race was on. Adams promptly caught a queen on fourth street to make a pair of queens. His board developed / / for a final hand of one pair of queens. Nguyen's board came / . Nguyen slowly squeezed out the top right corner of the card and saw the tell-tale line of a face card. "Picture!" he said excitedly, almost falling backwards off the stage. Nguyen moved the card to the center of the felt so that all of his railbirds, crowded around the table, could see it. Then he opened a corner so that only they could see it. They exploded in cheers. "KING!" 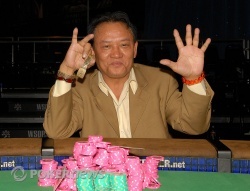 Nguyen's brother said, and sure enough it was the , giving Nguyen a pair of kings and the best hand. 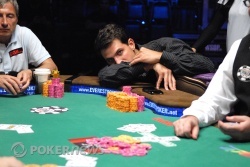 Adams was eliminated in second place, leaving with $243,958. And with that bizarre conclusion, the tournament ended. Brandon Adams brought it in with the as Men Nguyen completed in the dark with the . Adams made the call. Both players checked fourth as Nguyen still hadn't looked at his hole cards. Nguyen again checked fifth as Adams fired a bet. Nguyen decided he'd better look at his hole cards and he decided to make the call. On sixth, Nguyen checked and Adams bet. Nguyen put in a check-raise and Adams deliberated before making the call. Nguyen again fired the river and Adams looked him up. "How do you not raise it?" exclaimed Nguyen as Adams showed aces up which was not quite enough to beat Nguyen's trip tens. "Well, I was thinking about it..." sighed Adams. He's now on life support with just 350,000 chips. Ever so slowly, Brandon Adams' stack is edging downwards. In back-to-back hands against Men Nguyen, Adams put in one bet on third and fourth streets and then folded as soon as the hand got to the big-bet streets. Nguyen has not been shy about showing his hole card in pots that he wins, showing first an open-ended straight draw with four Broadway cards and then pocket aces. Adams is down to 900,000 chips now, just 7.5 big bets at the current limits. Nguyen has the rest of the chips, 3,600,000 in total. Refreshed and ready to gamble, the two players are back and play has resumed. Despite playing just one level since the last break, both Men Nguyen and Brandon Adams were adamant about taking another break - both virtually walking away from the final table until their wish was granted. We'll be back in ten minutes. After a lot of banter and mostly "raise and take it" hands, there was finally a hush over the final table as the two players clashed in a big pot. Brandon Adams was the bring-in with the as Men Nguyen completed with the . Adams put in a raise and Nguyen called. Adams led on fourth and fifth, before Nguyen paired on sixth to take control on sixth and seventh. Adams thought for a long time before making the call. "You got it," said Adams as Nguyen revealed two pair to the cheers from his fans on the rail. Adams is now down to 920,000 with Nguyen up over 3.5 million.